He stands bolt upright, looking straight into the camera. The man is young–probably in his early twenties–dressed formally in jacket and tie with a corsage pinned to the lapel. Black hair is combed flat and parted hard to one side with a pair of troublesome locks springing loose across the forehead just above his eyebrow. The facial expression is curious: fixed formal, let’s-get-this-right sternness appears just on the edge of breaking to a suppressed, forbidden smile. This may have been his wedding day. 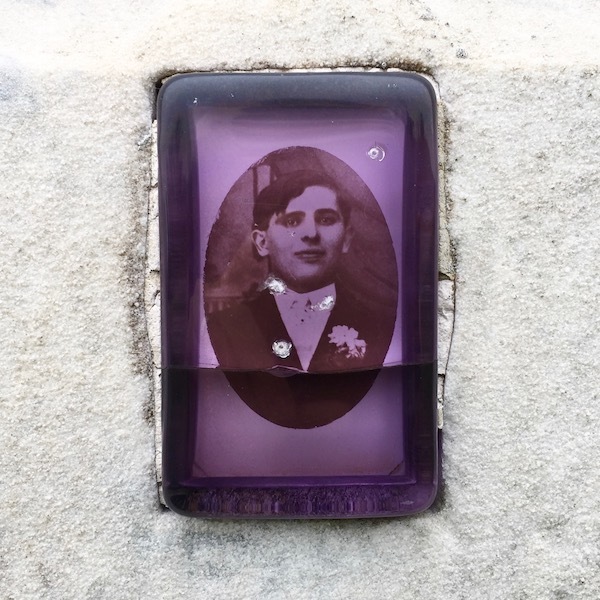 The small rectangular photograph is preserved in thick, transparent violet-hued Lucite and has one transverse crack across the man’s chest. A handful of small dings decorate the surface as if an assailant has taken to it with a crude weapon but gave up before doing any real damage. Otherwise, it is in fine shape. 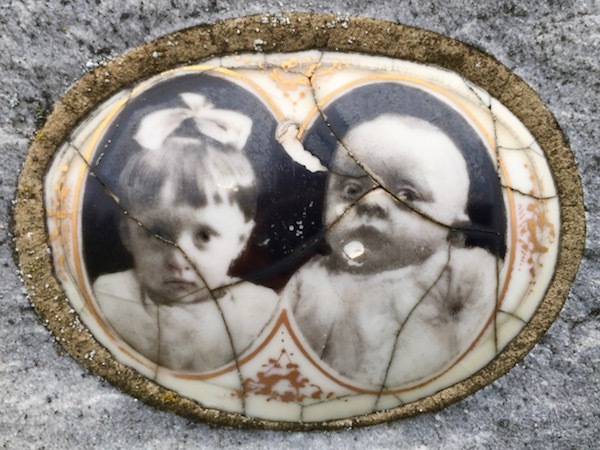 The irony of the photos mounted to headstones at Loretto Cemetery–most preserved on ceramic discs as we discussed in the previous post, but this and one other encased in thick acrylic–is that for so many, we don’t even know the names of the deceased. What’s unique among the vast majority of photo markers here is the complete absence of identification remaining. 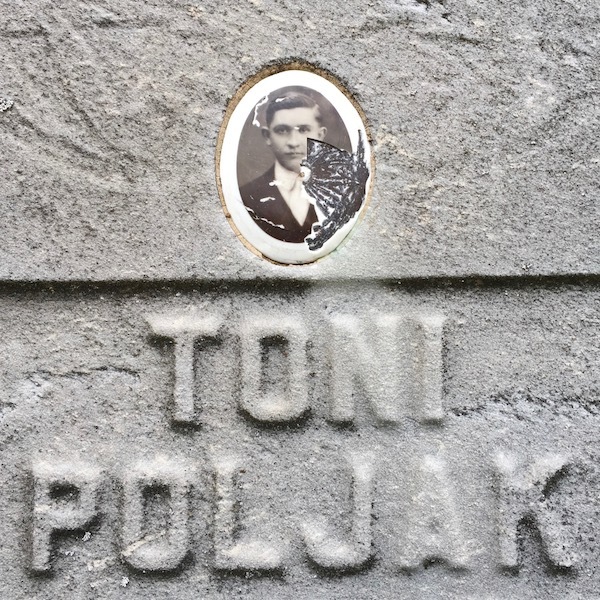 At one time, the de rigueur details–name, birth and death dates, perhaps an epitaph or Lahke mu Zamlja inscription–almost surely filled the flat faces of the stones. But now on all but a few, they’ve been completely wiped-clean. How this came to be, we can only speculate on–but that’s what this blogger does best! It seems likely the cause has to do with the underlying material (marble? fieldstone?) and what was literally falling from the sky around Pittsburgh through most of the twentieth century. With the Jones & Laughlin steel mill occupying both sides of the river just downhill from Loretto Cemetery until the 1980s–not to mention plenty more like it up and down each of the rivers–regular doses of acid rain had to do a number on all the headstones made from susceptible materials. This is a noteworthy turn of the tables for an environment where typically all we know are names and dates, forever left to wonder who these people were. 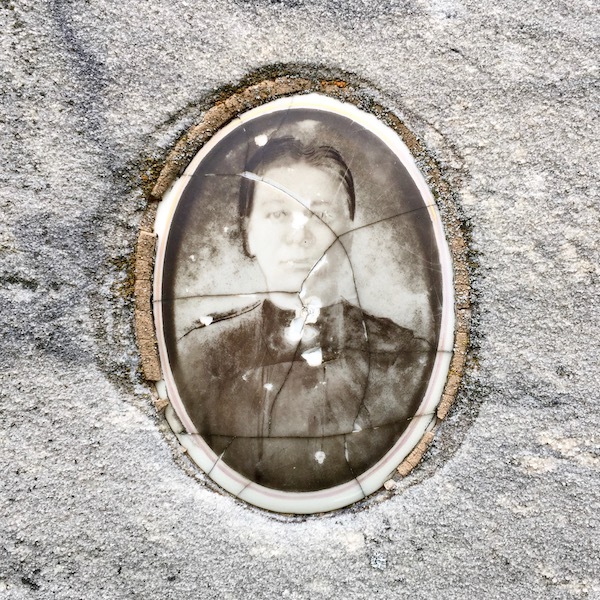 In Part 1 of this story we looked at a bunch of these headstone photos where the name of the deceased may or may not be known, but at least we got a pretty good (literal) picture of him or her. 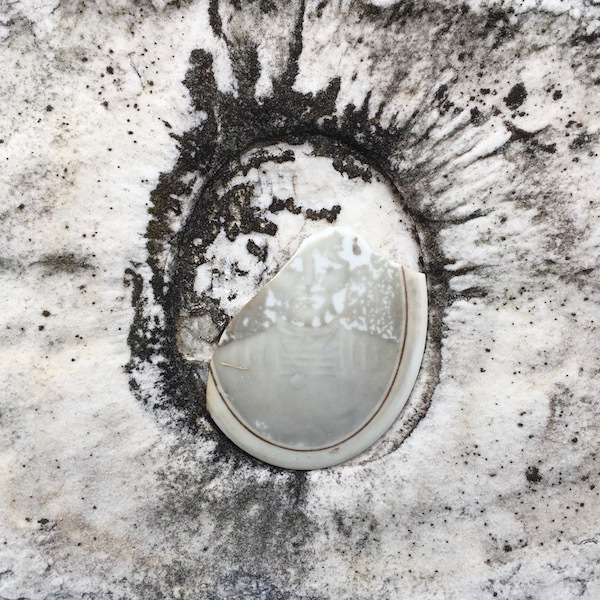 In almost all cases the ceramic has weathered with irregular cracking throughout the piece, but the image survives with enough clarity to get a sense of the person below the earth. Not all these photos fared as well, though. 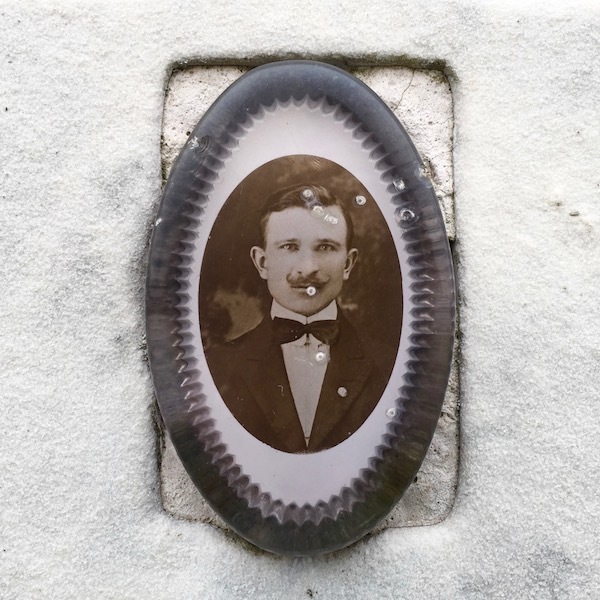 First of all, at this point there are roughly an equal number of empty oval cutouts in headstones where the photos simply don’t exist any more. It’s impossible to know if these were stolen or vandalized or simply dropped out of their markers through a century of freeze-and-thaw cycles. But even the ones that are still here aren’t necessarily all here. 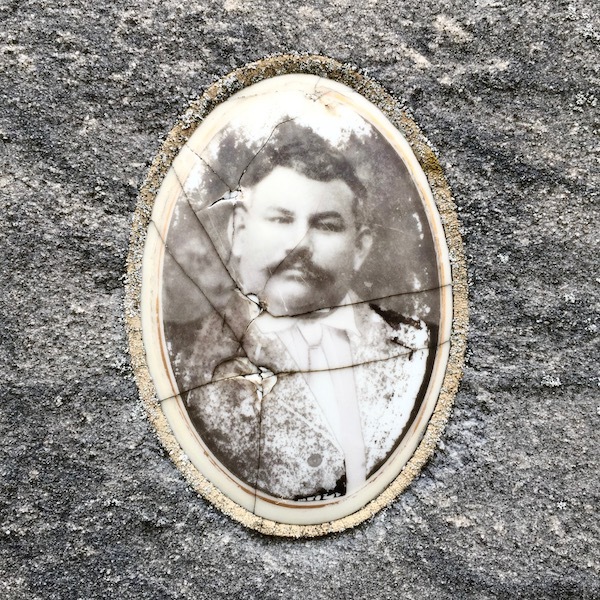 The sun had faded a number of the South-facing photos to mere ghosts represented in strange gray negatives. One of the pieces (above) has been broken with only the bottom half remaining. The detail is all gone, leaving just a vague outline of the woman’s face and basic description of the house dress she wore in the photo. 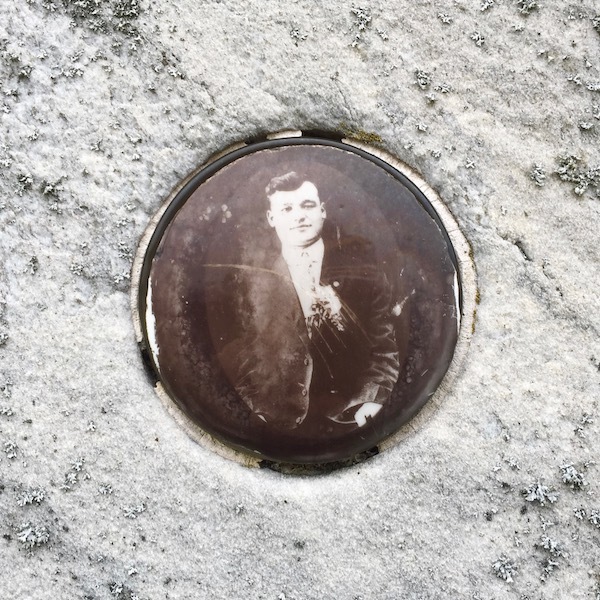 Consider the plight of Joseph Andreucci (above) whose loved-ones ponied-up for a beautiful deep red and black granite that never suffered the erosion present on so many of the other stones. All this only to have his photo in military dress attire worn- or scraped-through to the iridescent green of oxidizing copper underneath. The poor fellow below is not only unknown in name, but unknowable as image. It appears that some miscreant took a hammer directly to the photograph, rendering it completely unrecognizable. All that remains is a hint of combed, dark hair above the damage and a suit with jaunty floral accent below. If it’s possible to end both on a high note and six feet under, we’ll wrap this whole thing up with the big smile and voluminous curly locks of Anna Vensak. Her passing in 1996 is decidedly outside of the early century/between-the-wars window where we find all the other headstones in the series. 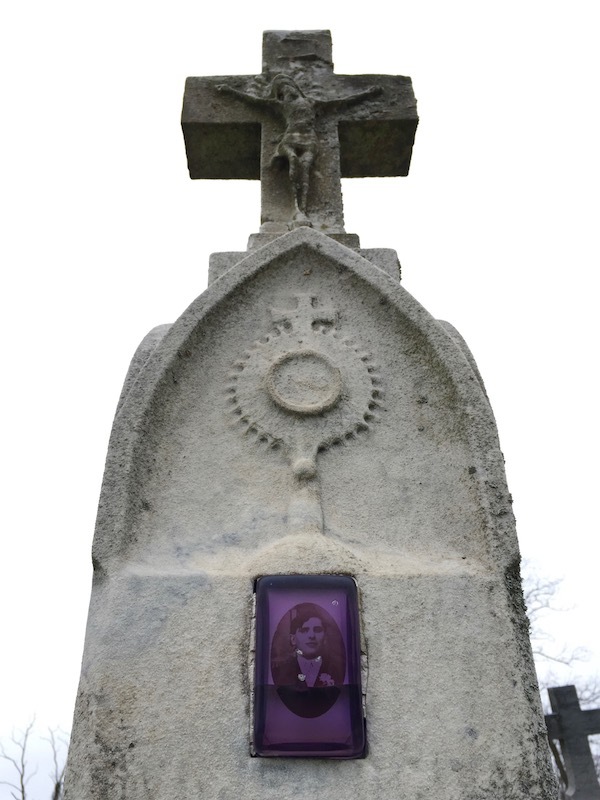 But it seems notable for inclusion by virtue of its proximity here at Loretto Cemetery and the monument-maker’s continued use of the technique–certainly antiquated by the 1990s–deploying the oval-shaped photo, mortared directly to an inset cutout in the stone. In an age where photographs are so immediate, disposable, and omni-present as they currently are, it’s fascinating to think of a time not that long ago when a single image may be all that remains of the legacy of a human being’s time here on earth. For that one last opportunity to reach beyond this mortal coil to end up cracked, faded out entirely, or lost in the weeds of Arlington Heights is humbling at best and reaches to full-on existential crisis at worst. Either way, The Orbit will still be here, looking out for you. The first thing you’ll notice are the names: Kolesar, Zgurich, Csajka, Lippl, Knezevic. 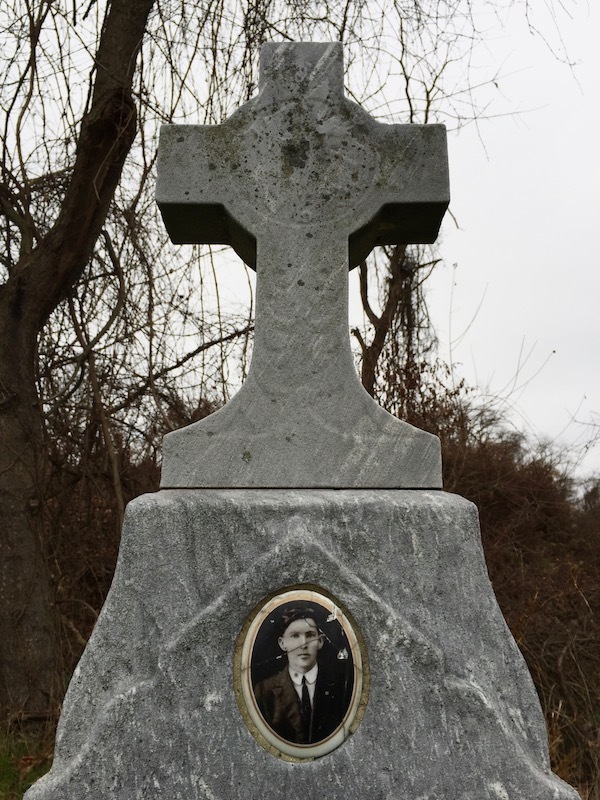 Any cemetery in Pittsburgh–certainly any older cemetery associated with a Catholic parish–will have its share of Eastern Europeans as long-term residents, but this one’s different. 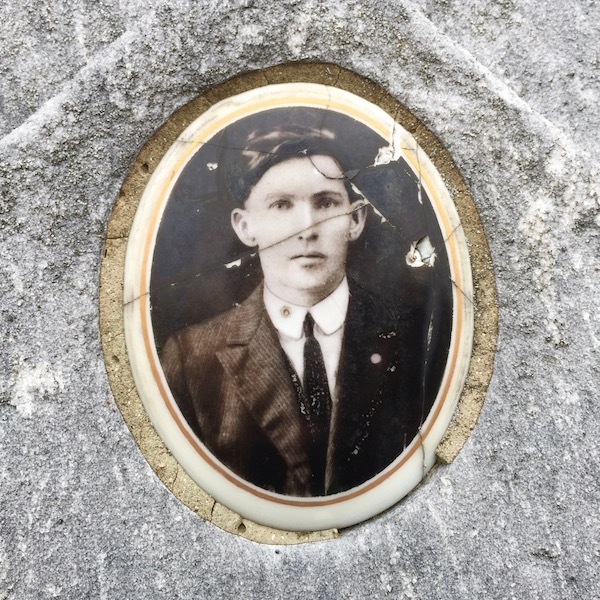 Sure, there’s a couple token Irish and Italian names loitering among the stones–we spotted a Finnegan, a DiBlasio, and an Andreucci–but you’ll not any find any Smith, Jones, Williams, or Davis buried here. Kusmircak, Blosl, Czegan, Fabijanec, and Kuchta are the rule, not the exception. 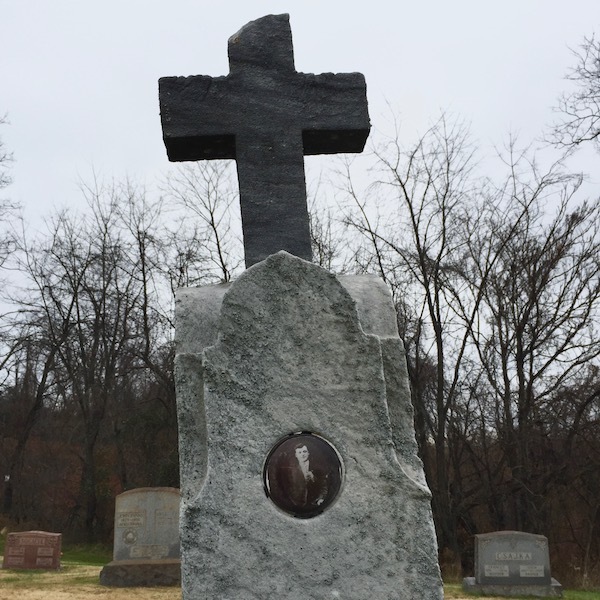 Loretto Cemetery rests at the very easternmost end of the big mount that rises above the South Side. Far below, but difficult to see from the steep angle, is an S-shaped crook in the Monongahela as it snakes between Hazelwood and the South Side. It’s an enviable location: quiet, vacant, and with terrific long views across the river to Oakland and Greenfield on the other side. We hadn’t come here looking for the dead, but any new cemetery is worth a poke-see when you trip across it. When we did, those names–Cvetkovic, Vnencsak, Mlinac, Turkovich, Opacic–just popped right out like candy on the shelf. Something interesting would surely await. 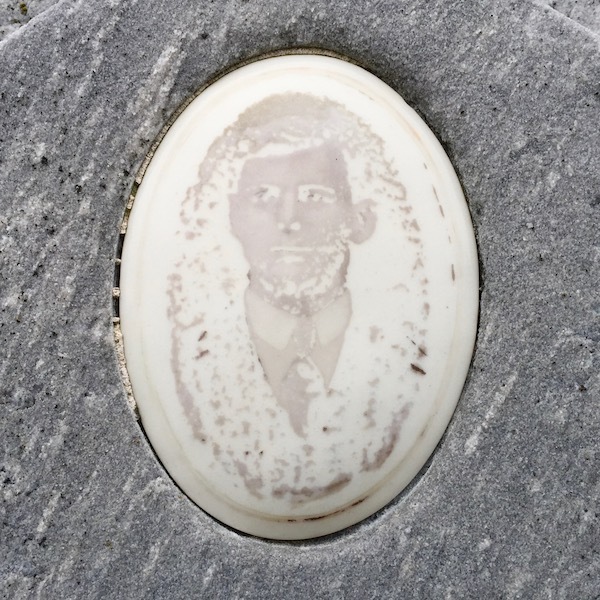 That something came in the form of a small black-and-white photograph, cast onto an oval-shaped ceramic disc and inset directly into one of the tower-like headstones. The posed portrait was of a middle-aged woman, “Mother” Antonija Komlenić, Victorian in both high-necked formal dress and dour, no-fun-allowed expression. 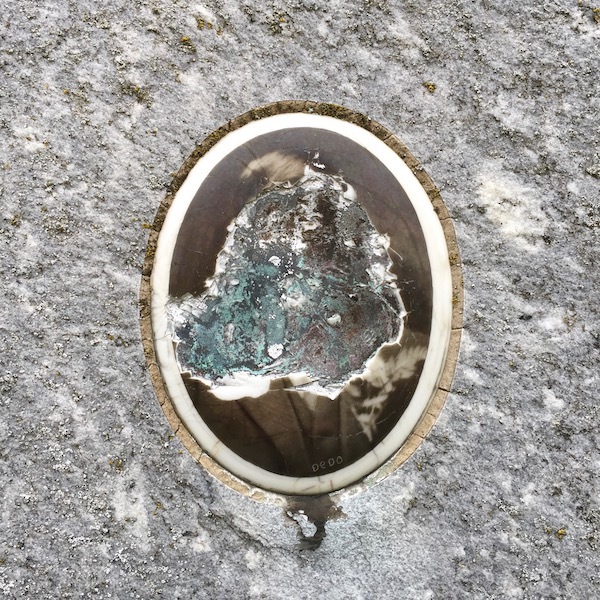 The colored mortar used to anchor the piece in stone is half chipped-away, eroded by a century of industrial mill exhaust and harsh Western Pennsylvania weather. The image is all there, but it’s faded and scored by sharp cracks awkwardly bisecting Komlenić’s face and torso. Looking around a little closer now, another headstone is embedded with the same kind of oval-shaped photo just steps away. This one features a large man in suit and tie, his head is cocked and he wears a kind of bushy mustache that hasn’t been in vogue for a very long time. Both the deep black of his dress jacket and the shade of the photo’s backdrop have worn away significantly. 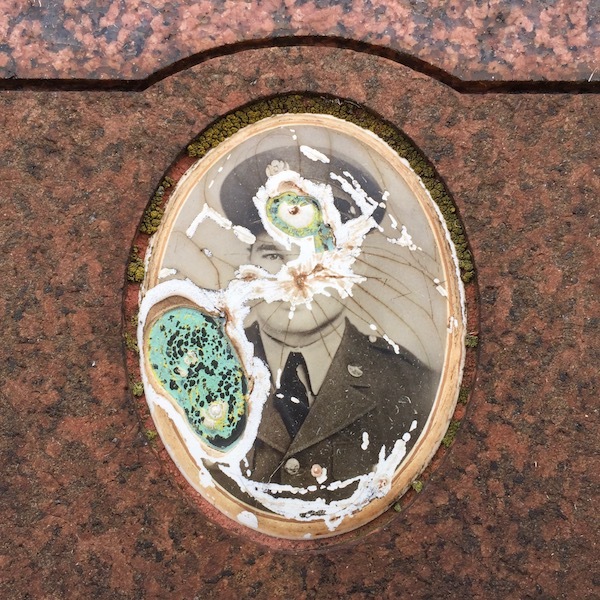 There’s an angled crack through the ceramic just under the deceased’s chin suggesting a sinister garrote, but the man’s face is calm–bored, even–and remarkably untouched by the hands of time. 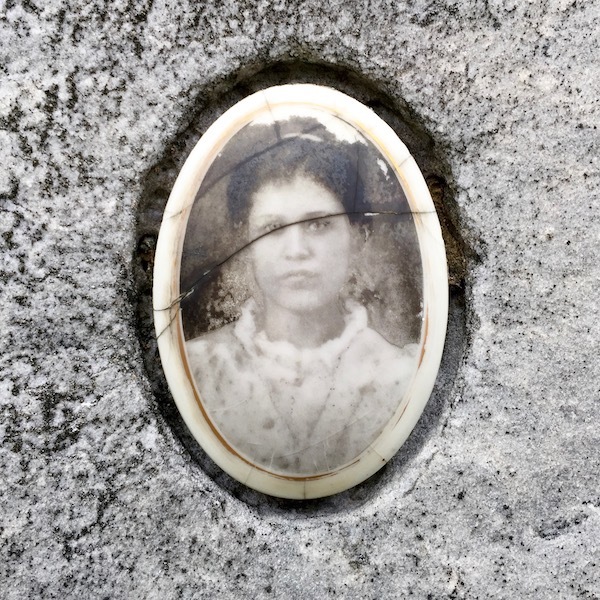 Suddenly aware and on the lookout for more, the grave photos are all over–on stones tall and thin, mounted below marble crosses and flat on granite. There may be a couple dozen in total, scattered across the sections closest to Loretto’s entry gate on Devlin Street. 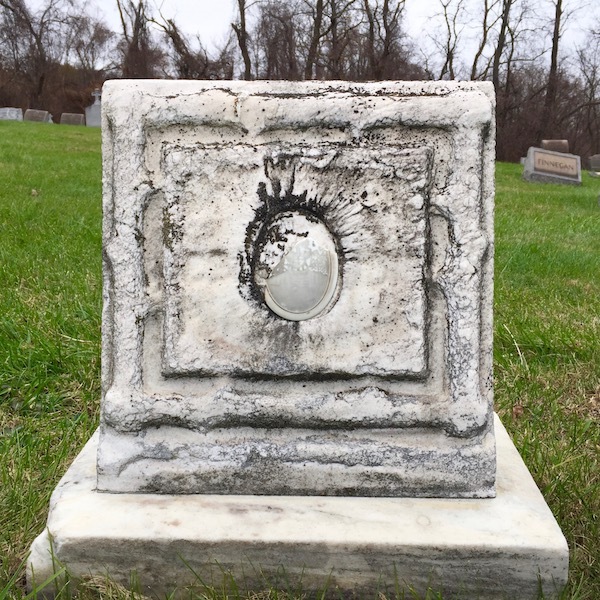 At least as many feature an empty cutaway in the stone where the inset image is no longer present; its former tenant stolen or broken, weathered or vandalized long ago. 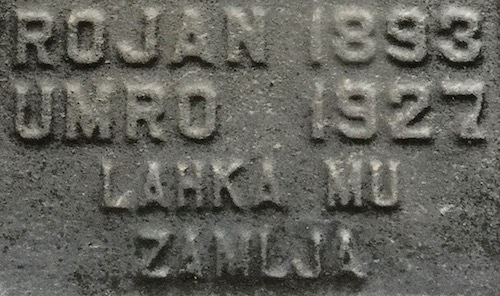 Lahka Mu Zamlja (alternately Laka Mu Zemlja), the Internet informs us, is either a Serbian or Croatian (perhaps both?) expression of condolence that translates to “may the black earth be easy on him.” Confirming this with Google translate was not very successful–it came up with preposterous gropes in the dark such as “easy land of mu” or “light mu country”. But as this is likely an arcane idiom, it seems a pretty safe Balkanization of Rest in Peace. We found this phrase on quite a number of Loretto’s graves, including some of the very ones with the inset portraits. While it’s impossible to know how “easy” the black earth was on each of these folks, the atmosphere above ground has taken varying degrees of torture out on their memorials. 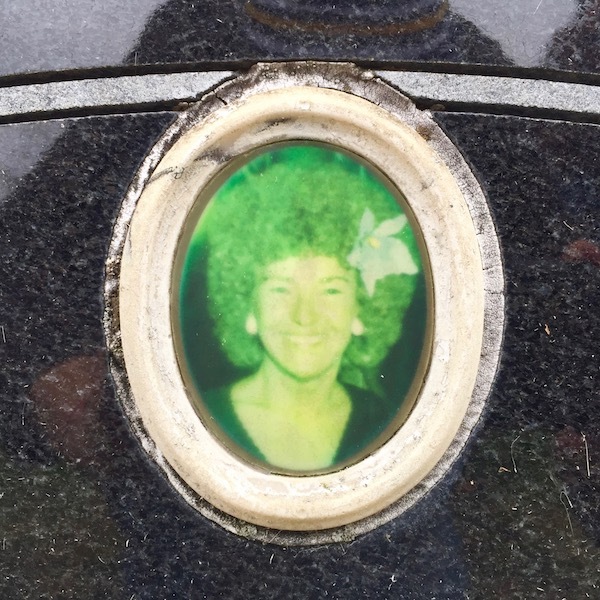 The photos here labeled unknown aren’t for lack of note-taking–there simply isn’t any text still readable on the headstones. The Orbit has spent considerable time in a whole lot of bone yards over the years and we’ve written quite a bit on the subject already. 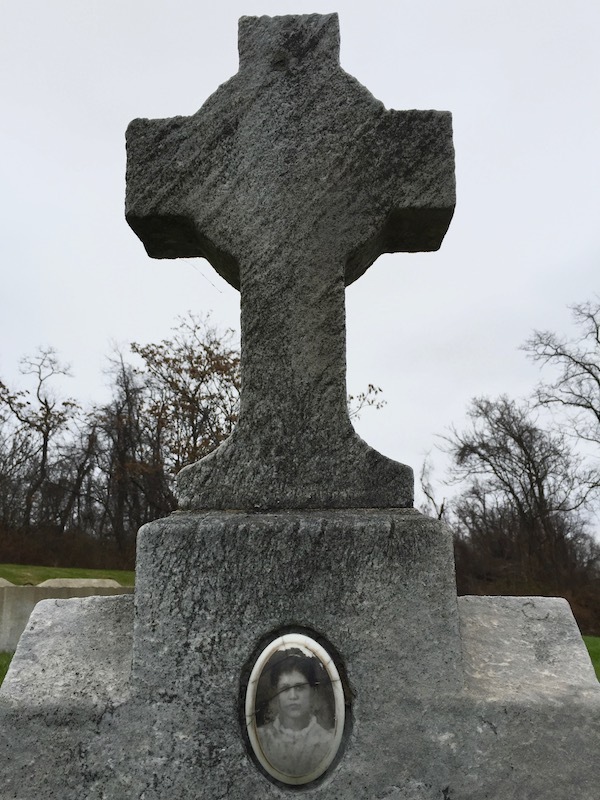 It’s nothing special to see more recent headstones with all manner of high-tech integral photos, bas reliefs, and digital engravings of the deceased, his or her family, loved ones, hobbies, and The Pittsburgh Steelers. 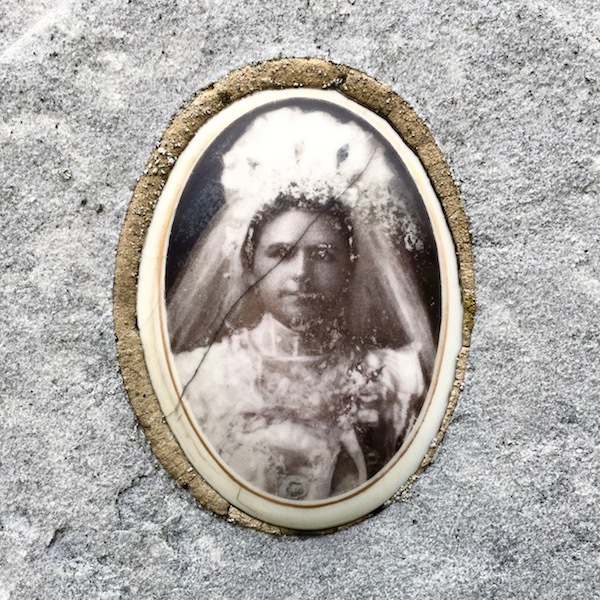 But these hundred-year-old…ish photographs-turned-grave ornaments are new to this blogger. 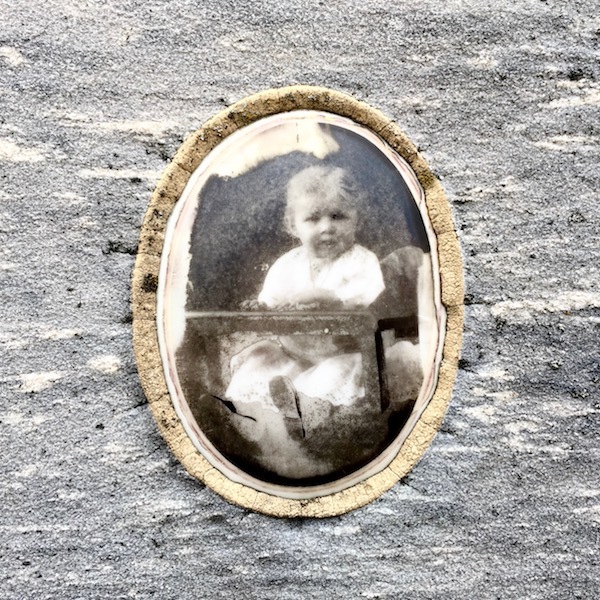 Even if I have encountered other late Victorian/pre-war ceramic photos on headstones before, it certainly wasn’t with the quantity or density found in Loretto. They’re something special, for sure. For one, simply because of the number that are still here [and that’s even more remarkable by the obvious number that are not]. More than that, though, it may be the context or the unpredictable deterioration they’ve been through, but the people in these photos seem to look right through you with a dark, foreboding wisdom of time and fate. Old photos are almost always interesting. In these, though, there’s somehow a deeper presence. 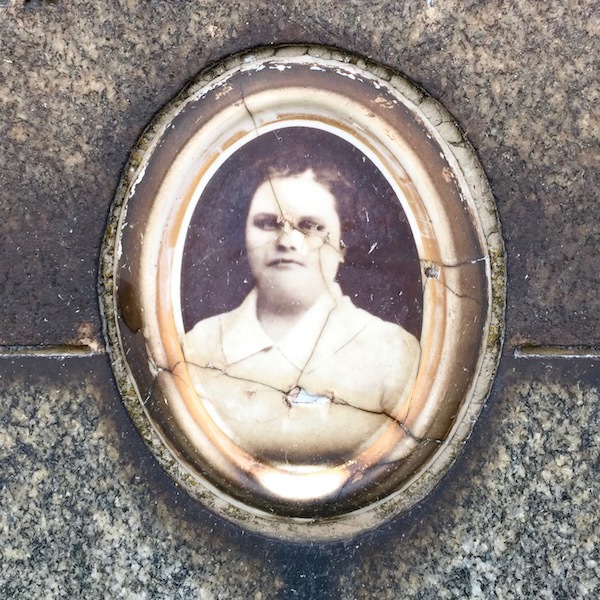 “Wife” Maria Miklin died in 1941, but her sepia-toned portrait as a young woman–scored, chipped, and cracked across the face and torso–seems to defiantly say is that all you got? Just wait ’til you get here, Jack. Lahka Mu Zamlja, indeed. If existential blogging is what you’re looking for, The Orbit is qualified to satisfy. This whole bag conjured up all kinds of deep thoughts on memory and preservation and forever–luckily, we’ve also got a bunch more interesting photos to back that up. We’ll get to all that in Part 2. GETTING THERE: Loretto Cemetery is in Arlington Heights and can be reached by going all the way to the east end of Arlington Ave. until it curls around to become Devlin Street. If you want a great hike, though, The Orbit recommends starting on the South Side at the base of the Oakley Way steps and making the journey all the way up and over on foot. 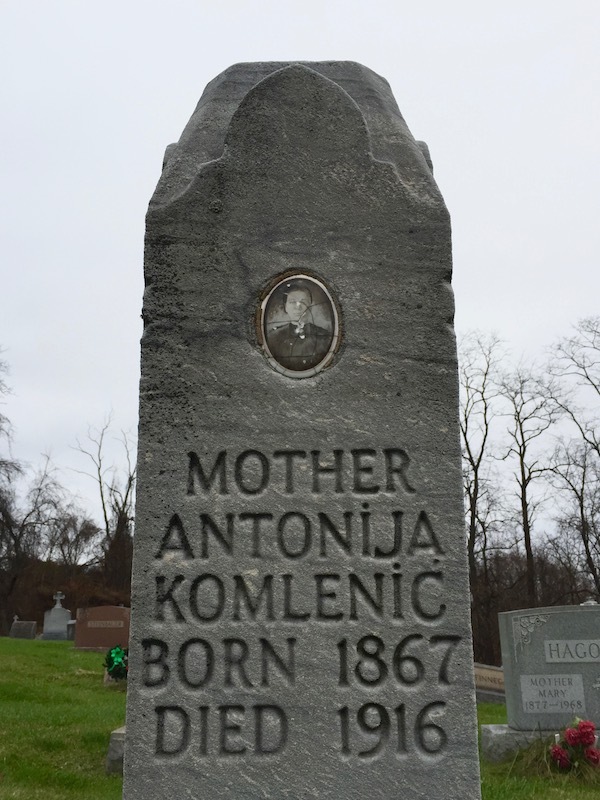 In this case, literally a century; Antonija Komlenić died exactly one hundred years ago, in 1916. Note to Google: when you get tired of mucking about with driverless cars, see if you can translate “mu” from Croatian! An incredible number of these headstones have no remaining legible text, but the ones that do date from the 1910s to 1940s.